To prepare to enter the work world, students can learn business and dining etiquette right on campus. From an initial lunch meeting to an internship interview, to the first day on the job, some basic rules apply. "While students learn basic manners and etiquette from their home life, business and dining etiquette adds a different twist," explains Keith Soster, director of Student Engagement, who offers etiquette workshops to U-M students throughout the year. "How you present yourself to others in the business world speaks volumes. People often form first impressions about others within seconds of meeting them, therefore it is crucial to ensure students are properly prepared to present themselves as professionals." In particular, "Meals can be extremely crucial in making a positive impression. Dining customs are often very important, and mistakes in this area could be costly. Knowing the etiquette well in advance should allow students to relax and enjoy what could be an amazing new experience." During Soster’s workshops, he covers topics such as when to begin eating, which foods are finger foods (and which are definite no-no’s), and where to leave silverware when finished eating. In addition, cell phone usage, handshaking, building business relationships, networking, international customs, and how to make an entrance are discussed. Soster says that in any business interaction, a greeting is key. "In general, look them in the eye, give a firm handshake, greet them by name, and say your own name with confidence. But most of all, smile and show enthusiasm." But greetings do vary. “For some countries, a handshake may not be the standard form of greeting,” Soster says. Timing an arrival is also important, he advises. "For a meeting in someone's office, don't arrive more than five minutes early, as they may be prepping for the meeting, or trying to get other work done. This may make them uncomfortable, and that is not a good way to begin a meeting. But don't arrive late either. Being on time for a meeting means arriving 5 minutes early. For an interview, arrive 10 minutes early." Whether the student needs to know how to make a proper introduction or even the best way to use email after a meeting, etiquette knowledge is necessary for making a good impression in the workplace. Being prepared with the rules of professional engagement helps the student be a little less nervous when they encounter any business function. 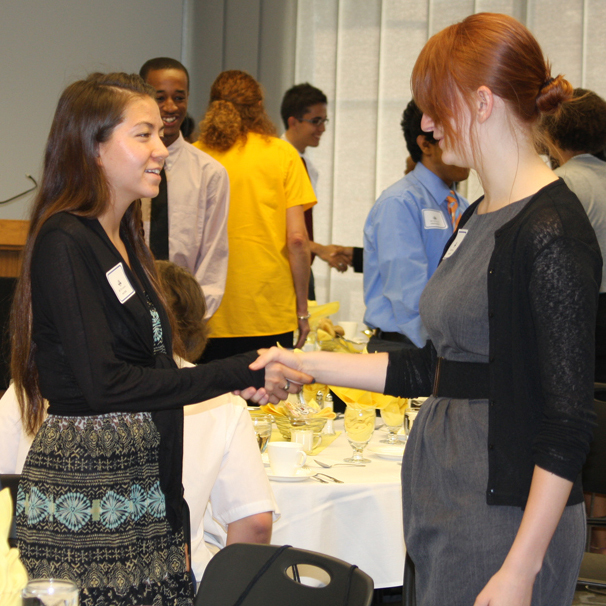 For information regarding business and dining etiquette workshops, you or your student may contact Keith Soster at ksoster@umich.edu.